Wall E is one of the few movies I actually purchased. I don't see how they could top it with a Wall E 2. For Pierce's sake; I hope so! It is a truly sweet movie and deserves a sequel. How funny, I guess Wall E isn't a teen thing as I have heard nothing about it. I think it would be a moneymaker. My grands like Wall E, too. Cute bag. I have not seen the movie - The Valentine deco is pretty cute. I hope so…it is a sweet movie. I love his drawing! I haven't seen the movie, but I think I need to now. 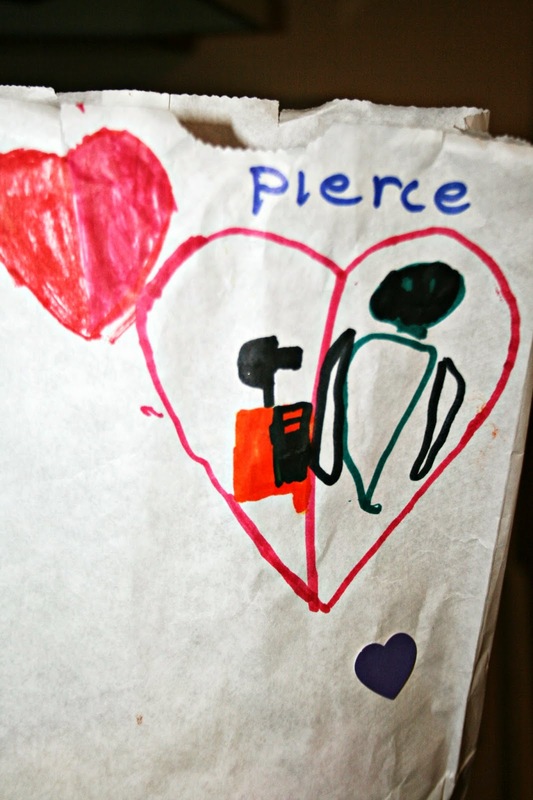 Love Pierce's drawing. He's so smart and imaginative! Cute! I saw that movie a while back (it's been years!) and remember that I really liked it. Very sweet and it is so cute how she teases him. Love the movie! Very sweet. I haven't seen Wall E...guess I need to check it out. Sequels are rarely as good as the original. Although I have never seen all of Wall E, the parts I have seen are sweet. Doesn't it have a serious message? I thought I heard that. Aw! That picture is precious. And that movie is such a good one. We loved it, too. The music in it is so good. I vaguely remember that movie. Either it came out while the kids were home and we went to see it as a family, or I took my wife to see it because she figured it would have a happy ending. So cute! I think a sequel would be great!